All wrestlers have profiles on Joshi City, you can click on their names above to go straight to it. The tournament kicks off with one of the brightest young stars in Pro Wrestling WAVE against a Freelancer that wrestles in a variety of promotions but mostly WAVE. ASUKA recently had a title shot, which she wasn’t successful in, but at 19 years old already has several big wins in the promotion as her stock continues to rise. SAKI is a nomad and wrestles mostly in small promotions, although since May the majority of her matches have been in WAVE. ASUKA comes in with the edge, but SAKI does have a couple years of experience on her. They tie-up to start, ASUKA pushes SAKI in the ropes but nicely gives a clean break. SAKI gets ASUKA into the ropes next but she elbows her before backing off, ASUKA elbows her back and the two trade blows. SAKI goes for a suplex but ASUKA blocks it, SAKI throws ASUKA into the ropes before rolling her up and connecting a series of boots. Elbows by SAKI, ASUKA goes for a dropkick but SAKI avoids it and delivers an elbow to her back. Reverse splash off the ropes by SAKI, but her cover gets two. Irish whip by SAKI to the corner but ASUKA comes out of it with a moonsault over SAKI before delivering a dropkick. SAKI falls out of the ring but ASUKA goes after her, ASUKA throws SAKI into the ring post and returns to the ring. ASUKA gets a running start and dives out onto SAKI with a tope con hilo, she slides SAKI back into the ring and hits a missile dropkick for a two count cover. ASUKA picks up SAKI but SAKI spins her away and hits an atomic drop. Running boot by SAKI, she picks up ASUKA but ASUKA pushes her off and hits a boot. SAKI slams ASUKA face-first into the mat, she puts her in a hanging submission before letting her go and hitting a reverse splash for a two count. ASUKA knocks SAKI back with a superkick, gutwrench suplex by ASUKA but SAKI comes back with a vertical suplex. Moonsault off the ropes by ASUKA and she chokeslams SAKI near the ropes, she goes up top and she nails the moonsault for the three count! ASUKA wins the match and continues in the tournament. A decent enough watch but nothing more than that. It had enough time considering what they were going for, but there wasn’t much of a structure to it as it was mostly just trading spots with some iffy transitions spread throughout. SAKI is an average wrestler, while ASUKA is good but not really at the level yet to carry someone with lesser skills. Nothing offensive but generally skippable, aside from some good moves by ASUKA. Always excited to see a match between two young hungry wrestlers, and these two definitely qualify as that. Hiroe Nagahama is 22 years old and debuted in 2014, just recently she changed her look and got her first title win as she looks to elevate herself past the midcard in Pro Wrestling WAVE. Winning a tournament like this would certainly help that. Mio Momono is a 19 year old wrestler from Marvelous, however she has wrestled in a lot of other promotions in 2017 and shows a lot of potential. Hiroe immediately dropkicks as the match starts, Mio dropkicks her back but Hiroe hits another dropkick and tosses down Mio by the hair. Mio returns the favor and dropkicks Hiroe into the corner before she puts her in a bodyscissors, but Hiroe quickly gets out of it and stretches Mio. Hiroe puts Mio in a crab hold, but Mio gets into the ropes for the break. Stomps by Hiroe and she hits a snap vertical suplex, another suplex by Hiroe and she covers Mio for two. Dropkick to the knee by Mio and she dropkicks Hiroe against the ropes, Hiroe gets back up and the two trade elbows. Dropkick by Mio and she hits a series of jumping crossbodies, but Hiroe kicks out of the eventual cover. Ankle hold by Mio but Hiroe gets to the ropes, Mio pulls Hiroe to the middle of the ring and immediately re-applies the hold. Hiroe manages to get to the ropes again, Mio goes up top but Hiroe elbows her before she jumps off and joins her. Mio headbutts Hiroe back down and goes for a diving crossbody but Hiroe ducks it, Hiroe hits a crossbody of her own and follows up with a vertical suplex for two. Hiroe picks up Mio but Mio hits a series of elbows, she goes off the ropes but Hiroe hits a Northern Lights Suplex Hold for two. She hits another one for another two count, Hiroe goes up top and she delivers a missile dropkick. Hiroe goes for a backdrop suplex but Mio lands on her feet, quick cradle by Mio but she gets a two count. Mio goes for a Rolling Clutch but Hiroe blocks it and they trade flash pins, Hiroe goes off the ropes and she applies the Cassandra for two. Mio jumps on Hiroe’s back and she delivers the JK Bomb (Code Red), and she picks up the three count! Mio Momono wins and advances in the tournament. Of the four matches in the tournament, this is the biggest mismatch. Rina Yamashita is the young future Ace of WAVE, she had a run with the title already this year and is also a major player in OZ Academy and SEAdLINNNG as well. Satsuki is a rookie from Ice Ribbon that has gotten a bit of a push but hasn’t shown much to me since debuting in March. She’s an older rookie at 28 which is probably why she is getting bigger matches, but hopefully she will start showing more improvement to justify her placement. They start with trading wristlocks and headlocks, they both go for shoulderblocks with Rina eventually knocking Satsuki to the mat. Rina picks up Satsuki and eventually manages to hit the scoop slam, Rina stomps Satsuki against the ropes before putting her in a Scorpion Deathlock. Satsuki gets to the ropes for the break, Rina elbows Satsuki into the corner and hits a series of lariats, cover by Rina but Satsuki gets a shoulder up. Satsuki finally knocks down Rina with a hard shoulderblock but Rina avoids her senton attempt, Rina picks up Satsuki but Satsuki hits a scoop slam. Senton by Satsuki, and she covers Rina for two. Crab hold by Satsuki but Rina reaches the ropes, stomps by Satsuki and she hits a body avalanche in the corner for a two count cover. Satsuki picks up Rina but Rina slides away and puts Satsuki in the sleeper, which Satsuki promptly gets out of by jumping backwards onto Rina. Elbows by Satsuki but Rina elbows her, Satsuki elbows her back but Rina drops her with a brainbuster. Lariat by Rina and she knees Satsuki in the back, another knee by Rina and she kicks Satsuki in the head. Back bodydrop by Satsuki and she hits a rolling fireman’s carry, diving senton by Satsuki and she covers Rina for a two count. Satsuki goes off the ropes and hits a jumping crossbody, she goes off the ropes again but Rina catches her with a lariat. Rina waits for Satsuki to get up and she hits a final lariat, picking up the three count! Rina Yamashita is your winner and advances in the tournament. One of the low-key biggest surprises in Joshi in 2017 is the sudden return of Nagisa Nozaki and her equally sudden push in Pro Wrestling WAVE. We don’t know too much about Miyuki, she debuted this year in Actwres girl’Z which doesn’t make TV too often, although she has had matches in other promotions including WAVE, REINA, and PURE-J. Nagisa returned to wrestling in August after four years away, she is a submission expert that hasn’t had a lot of success in her career but has been doing well in WAVE the last few months. Nagisa is definitely the wild card in this tournament, her style is different than most so she brings something different to the table. Miyuki asks for a handshake but Nagisa isn’t interested, quick dropkicks by Miyuki but Nagisa chops her to the mat. Nagisa slaps Miyuki’s chest repeatedly in the corner before applying a crab hold, but Miyuki gets to the ropes for the break. Running boot by Nagisa but Miyuki sneaks in a rolling bodyscissors hold, Miyuki goes for a suplex but Nagisa blocks it. Miyuki goes off the ropes but Nagisa swats aside the dropkick and boots Miyuki while she is in the ropes. Nagisa goes out to the apron and kicks Miyuki with her heel, cover by Nagisa but it gets a two count. Miyuki chops Nagisa and they trade strikes, which Nagisa gets the better of. Miyuki gets back up and scoop slams Nagisa, covering her for two. Miyuki tries to get Nagisa on her shoulders but Nagisa blocks it, big boot by Nagisa in the corner and she hits a half hatch suplex. Nagisa goes off the ropes but Miyuki ducks the boot and goes for a few flash pins with no luck. Dropkick by Miyuki, she headbutts Nagisa and hits a missile dropkick off the second turnbuckle. Diving elbow smash by Miyuki, and she covers Nagisa for a two count. Miyuki finally gets Nagisa on her shoulders, running fireman’s carry roll by Miyuki but Nagisa gets a shoulder up on the pin attempt. Miyuki gets on the second turnbuckle but Nagisa avoids the diving leg drop and quickly puts Miyuki in a sleeper. Miyuki struggles for just a moment but quickly goes out, and the referee calls for the bell! Nagisa Nozaki wins the match and advances in the tournament. A step down from the last few matches, it wasn’t bad but it wasn’t particularly interesting either. I’m intrigued about the direction they are going with Nagisa, as she is winning matches suddenly with sleepers to set up that she can win any match at any time. Sadly, Miyuki isn’t very good yet and Nagisa isn’t an elite wrestler either, so much of this just felt directionless. With short matches, long strike exchanges feel a bit out of place and it didn’t really pick up until the last few minutes. A little bland, but the right wrestler certainly won as Nagisa brings a unique style to the tournament. 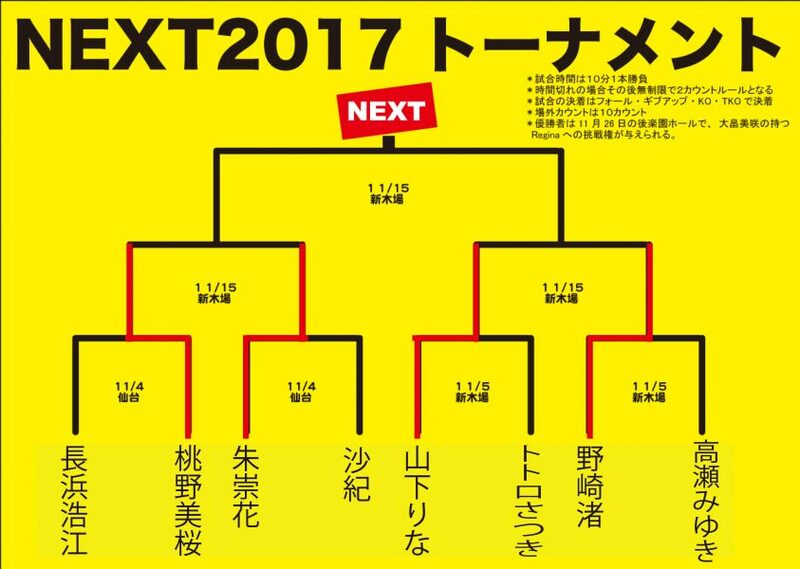 The rest of the tournament is set to air on 11/21, so I will finish reviewing the tournament on Thanksgiving and post my final thoughts on all the matches.